Traditionally, scientific work and academic papers are the major target and consumer of this layer of feedback. 1 An annotation starts by highlighting a statement or paragraph. 3 The annotation then becomes visible to the editors who make a choice to follow up or reject a suggestion. 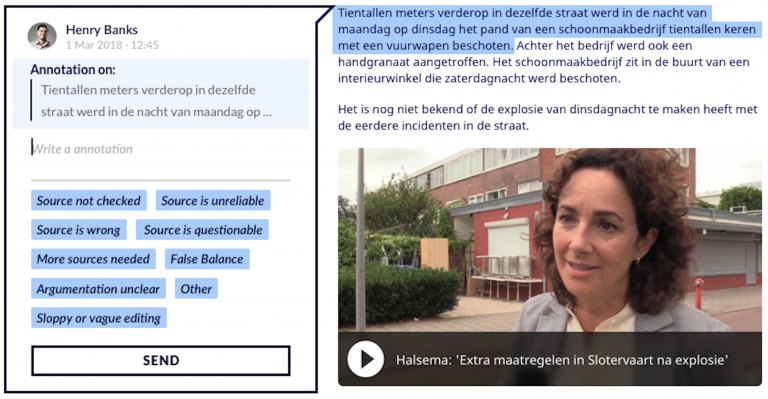 Annotation labels make the interaction between the community and journalists more efficient and clear. It also guides the annotators so they can be more objective and make meaningful contributions. How to define labels that summarize the feedback and give input for meaningful improvements? This is our ongoing search. Here you will find the labels as currently in use in the editorial process in a test with NU.nl. Do you read critically? Are you observant, accurate in nature and open to discussion? Do you have special domain knowledge or text expertise? Annotators receive extensive instruction and testing in order to assess their suitability.